Each week CIT’s will sit down with one of the Owners to discuss important skills like leadership, responsibility, community, and the importance of empowerment. Each CIT will have a coach as a mentor during the camp week. Each week your child will be partnered with a different coach to learn their coaching style, learn from mistakes, and to engage a coach on a personal level. Your child’s mentor will also provide an assessment of your child in areas including; leadership, responsibility, and work habits. CIT’s will do a little more playing than in past years. They will now be in a formal CIT group. Under on of Viking’s director’s supervision, CIT’s will take turns leading and organizing games with the goal of putting into action the things they have learned from their mentors and conversations with the Owners. CIT’s are lead by our CIT Coordinator to develop important skills needed to become a successful coach at Viking. Participants will develop a personal coaching philosophy and a list of personal coaching objectives. Participants will learn about various coaching “styles” and will begin to hone a style that fits their goals and objectives. Participants will learn about and practice principles of teaching and coaching. Participants will learn about and practice areas of sport leadership, including (but not limited to): conflict resolution, giving and receiving feedback, motivation, and communication. Participants will learn about the importance of character education and its beneficial role in youth sport. Participants will review and practice ways to implement character education into everyday coaching interactions with youth sport participants. C.I.T.’s are asked to make a 6-week commitment to the program (may be a combination of weeks, i.e. 3 weeks in July, 3 weeks in August) and are required to remain at camp from 8:30am-3:30pm. The February and April Vacation Camps are options as well*. C.I.T.’s will have weekly meetings (typically on Monday and Friday) from 3:30pm-4:30pm. C.I.T.’s will have occasional take-home assignments. The 6-week commitment is a recommendation and NOT a requirement. *If the CIT would like to participate in one or both of the vacation camps, they may still participate in six weeks of summer camp without an additional fee. In fact, we recommend that our CITs work at least one of the Vacation Camps to get experience prior to the start of summer camp (but it is not required). To start the process of being a CIT download our application. If you wish to add additional weeks, it is $100/week. *Viking can not prorate the fee if the CIT is unable to participate for six weeks. 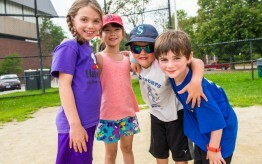 If the CIT would like to participate in one or both of the vacation camps, they may still participate in six weeks of summer camp without an additional fee. In fact, we recommend that our CITs work at least one of the Vacation Camps to get experience prior to the start of summer camp (but it is not required).